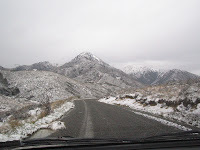 Skiving off work extra early on Friday and getting on the road helped my pre-race jitters a bit, but by the time we got to Hanmer it was snowing and I was feeling quite worried that we might not make in at all. This was exacerbated by the “Chains Essential” sign on Jacks Pass and the snow on the road. We made a quick return to Hanmer to call into the Krank shop and once more Neil provided as with the goods in the way of excellent advice and we were back into the snow. After about half an hour of driving we popped out into the sun and although it was pretty cold there was no more snow (in fact if we’d been half an hour later we wouldn’t have even seen any snow). I was paying careful attention to the road as this would be the route for the race. I was worried, and when we got to Wards Pass I was really worried. This was a damn long way and it had a number of decent climbs in it. 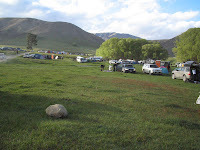 Arriving at the Molesworth Station around 4ish it was lovely and sunny and in no time we had a lovely flat camp site set up by the river and were relaxing in the sun. Well, Pete was relaxing. I was checking my bike and making sure I had all the right things in my pack and generally fussing. With a hot pasta dinner in us we climbed into the tent before the sun went down to try and retain as much warmth as we could. 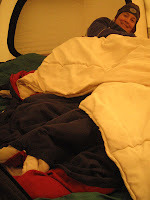 Turns out this was a brilliant idea as it was a 5 degree frost and we were warm and cosy and slept extremely well. Unlike a lot of people. We awoke nice and early around 5ish and crawled out into the freezing morning air. Brrrrrrrr. Thank goodness for Kathmandu snow socks. My poor bicycle was frozen to the ground and everything was covered in ice. I wanted to take a photo, but the cold had killed the camera battery so no shots from the race unfortunately. Soon after our stuff was all packed up and Pete was heading off in the convoy back to Hanmer, leaving me sitting on the side of a little hill in the sun, trying to stay warm and waiting for the race to start. I chatted with a few people and soon we were off for the 1.5km rolling start, up a nice steep little hill, just to warm you up. Nasty. I had a plan for all the hills and that was to spin as gently as I could and not expend any extra energy. Thumbs tucked under and upper body low to the bars I put this into practise and was up this nasty wee climb like it was nothing. Yay. Unfortunately I couldn’t really open it up on the other side as there was too much traffic, but I did work my way forward. At the base of Wards Pass we crossed a small ford and I didn’t think much of it at the time. My feet got wet, but it was sunny so I wasn’t too concerned. Wards Pass stretched up steeply in front of me and I resolved that no matter what I was going to ride all the climbs. Dropped down into grannies and started spinning and breathing and just concentrated on keeping the rhythm and not going too fast. Lots of people whizzed past me at the beginning of the hill but soon I was passing walkers and the odd strong person was passing me. I got to the top sooner than I thought and wasn’t even out of breath. I popped my sunnies back on, zipped my top right up and cruised over the crest and down the other side. Wahoooo. I zoomed past lots of people on the descent and was grinning as I crossed the bridge onto Isolated Flat. I quickly put my strategy into action for this bit and built myself a nice wee bunch. Three of us at the start but when it was my turn at the front I managed to hook us onto another bunch and we were flying across the flat at about 30km. The next 20km were a scenic blur. Climbs and descents and nice riding. Just before the halfway point I started to notice that my feet were freezing. Despite the sun there was a gentle southerly breeze and it was chilling my legs. My feet were really hurting at the halfway point and the pain was beginning to shoot up into my legs. It was about now I started ruing the fact I’d put my snow socks in the van to head back to Hanmer. I did have a dry pair of socks, but they were just cotton. I stopped at the halfway point and whipped my shoes and socks off and tried to massage some life back into my feet. I couldn’t feel my toes at all so I decide to have some lunch and give my feet a chance to thaw out properly. After a sandwich and some “delicious” leppin I put my dry socks on and my damp woollen socks over the top and headed off. Much better. Then pain in my feet was gone and so was the pain in my legs. I was a little concerned that I felt like this at the halfway point, but I pushed that thought away. I’d be going for around 2hours 30mins so was feeling good about finishing inside 6 hours. Of course at this point in time the guy who got first was already in Hanmer! On I went, enjoying the scenery, passing people on the descents, being passed by the same people on the climbs, but riding at a pace I knew would get me to the end. At about the 50km mark my feet started hurting again and I could feel my legs getting colder and colder. I had tights in my bag, but instead of being sensible and pulling over I decided to tough it out to 60kms before stopping. In retrospect this decision, and the decision that my feet would be warm enough without my big socks, were my biggest mistakes. My feet and legs got progressively sorer and finally I pulled over and pulled on my tights over my shorts. I took the opportunity for some more cheese and marmitey goodness and set off again. I could instantly feel my legs warming up and working better. In fact I started looking forward to the hills because even though they hurt my legs got nice and warm. It’s fair to say those last 20kms were horrible. They hurt a lot. More than I’ve ever hurt in a ride before. I was making deals with myself to ride for another 30 mins and then have a minute’s rest. It was pretty bad, but I wasn’t getting in a support van and I wasn’t going to walk any of the hills. By now the wind had got up a bit more and it was a constant oppressive force against me. How I longed for a bunch to tuck in behind. At one point just past the 5 hour mark I hooked onto a couple of guys for a short while, but they were working way faster than I could keep up with. It was just a mental game for me now. My legs were gone and no amount of food was going to bring them back. Seeing the pine trees on the back of Jollies Pass was a great boost. I knew it couldn’t be much longer. Then another hill, a man went past me asking if this was the last and I told him I hoped it was. It wasn’t. We turned off to Jollies Pass. I was really worried about this and told myself to just keep spinning. It wasn’t the nightmare I thought it would be, but it did go on and on and on. Finally I reached the top, feeling broken. I started down fairly tentatively as my senses weren’t really working to well and I felt a bit unstable. After a couple of minutes the adrenalin kicked in and I felt like a new person and really started riding down at speed. I flew past heaps of people. A woman in my grade had passed me at the base of Jollies Pass and I really wanted to catch her. I tucked low and pinned it down the hill. I was in control at all times, but it was pretty obvious some people weren’t as there were some scary looking skids and a group of people picking someone up. There was one hairy moment when I approach a big diagonal rut at high speed, but I unweighted the bike and sailed across it. At the bottom of the descent I started pedalling with reserves I didn’t know I had and soon I was passing my target. Yes!!! Then onto the singletrack and I had to get off as there was a line of people walking it. Frustrating. Then up a terrible tiny climb and pedal pedal pedal to the end. I’d made it and I was completely destroyed. I just lay down and waited for Pete to come to me. Then we hobbled out the way and I got my shoes off. It took a while but once my feet defrosted I felt immeasurably better. And after wolfing down some meat and chocolate milk I was better still and actually able to talk coherently. I finished in the 5:53:43, under the 6 hour mark and 19th in my division. I’m a bit disappointed in my time, but I’m stoked I achieved my goals and rode all the hills. 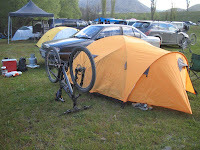 80kms is a very long way and 5hour 30 is a long time on a bike. Huge thanks to my lovely husband for driving me in and looking after me at the end and for the rest of the day, putting up with all my riding and generally being wonderful. Also big thanks to Andy from Hub Cycles. He went the extra mile to get me a pair of Serfas RX Lite Woman’s gloves. These gloves are the best I’ve ever had and at the end of the race my hands were fine, no pain at all. Without Andy going the extra mile to get them in for me I’m sure I would have been suffering even more. Congratulations to Chris and Logan for completing their mission too! I’m going to have a lazy week and just play on my bike, but I’ll need to get into some decent hill ride before the Moa Hunt in 3 weeks. Pah. The Moa Hunt will be easy peasy compared to that! Looking forward to sifty silliness on Wednesday! Great stuff! :) Give it a couple of days to forget how hard it was and how much it hurt and you'll be rearing to go for the next race! 6 hours on a bike is a very long time - congrats!